There were days, especially in the beginning, when I used to wonder how we would ever survive. I spent the last decade hoping for another brother or sister for Lewis and for three consecutive years we were blessed with Eva, Megan and Harrison. Having babies did not come easy to us, nor without its heartache, so it was with pure unbridled joy that we were finally blessed with Eva and yet somewhat short lived when six months later I found myself staring at a positive pregnancy test. Sixteen tests later I finally realised that this was most definitely not a trick of the light, a false positive, an evaporation line or even a sleep-deprived hallucination. This was most definitely happening!! At that stage you can do one of two things, you can panic or you can embrace it and although it was certainly not part of the plan, we took it in our stride and we told ourselves that although this baby was not planned, he or she was very much wanted. Our news was received very differently by friends and family. There were those who were of the opinion that it was great news, the idea that it was better to ‘get them all out of the way quickly’ and let them grow up close. There were those who took the news very badly, said that Eva was just a baby, did we not realise how this was happening? How could we have been so careless? And then there were those who found it hilarious, who laughed manically, told us we were insane and secretly thanked God that it wasn’t them that would be dealing with two under two. But for us, however hard we knew it would be, we were excited, we were happy and we actually felt very, very lucky. I don’t think that anyone can prepare you for the whirlwind of finding yourself with a newborn, a fifteen month old and of course Lewis who by then was nine and for whom the novelty of a baby was already wearing thin. Megan was let’s say, for want of a better word, a ‘difficult’ baby and those first few weeks were just a blur of sleepless nights, dirty nappies, tears and tantrums and by the time she reached a couple of months old I genuinely thought that Gaz and I were going to end up killing each other. Our lives became a constant battle and we found ourselves inadvertently playing a game where we both fought for the title of The Most Tired Person On The Planet. Every night without fail we would find ourselves having the same old argument, ‘I haven’t slept all night’ I would say. ‘I haven’t slept all week’ he would reply. ‘I haven’t slept all month’ I would shoot back, ‘I haven’t slept all year’ he would declare, his face triumphant. ‘I haven’t slept my whole life and I’m older than you so I win!’ I would say, momentarily joyous at pipping him to the post to win the prize. We would fall asleep, back to back, opposite ends of the bed, both seething at the thought of waking for another night feed while the other one slept. It was a torturous, exhausting, soul destroying kind of groundhog day and as much as I loved my children, it was harder than I ever imagined. And then one night, despite all of the weeks of arguing and resenting him the very air that he breathed, we must have decided that we did still kind of like each other and by the time that Megan was three months old I was sat staring at yet another positive pregnancy test. I wont lie to you, we did not take the news well. We cried, we panicked, we argued, we threw the blame back and forth, we clung to ‘what ifs’ and ‘if onlys’ and then we did what any grown adults would do and we buried our heads firmly in the sand!! It was months before we really allowed ourselves to really think about the reality of three under three and the impact that it would have on us as a family and as a couple. We found ourselves trading in our regular 5 seater car for a 7 seater, our three bed terrace for a large family home, researched treble buggies, buggy boards and baby slings and by the time my due date came around we slowly allowed ourselves to imagine that actually, our little accident might be the best thing to ever happen to us. And it was. It really and truly was. It was hard, it IS hard, but it is also the most amazing, crazy, exciting adventure that we have ever been on. We are tired, scrap that, we are exhausted. We haven’t slept in three years, we have forgotten what hot food tastes like, what it was like to leave the house without a lorry load of luggage, what it feels like to be washed/brushed/shaved. Our house is a mess, an explosion of toys, games, clothes and crumbs. We’ve had to sacrifice our foreign holidays, our nights out, our shopping trips and weekend lie-ins. We’ve lost track of time, of days, of social circles and current affairs and we have aged…dramatically!! But the first time I saw the four children together, lay there exhausted in my hospital bed, my heart could have burst with pride. The day we brought Harrison home and the three babies screamed simultaneously, so loud that I thought my head would split right open, I beamed with happiness. The first time we left the house and we were stopped countless times by people telling us ‘Youve got your hands full!’ or ‘You must be crazy!’ and I wanted to shout from the rooftops that I AM crazy, absolutely ridiculously crazy in love with these four little ones. The first smiles, the first kisses, the first time we snuggled up together as a family of six and I looked across at my husband and I loved him with all of my heart. 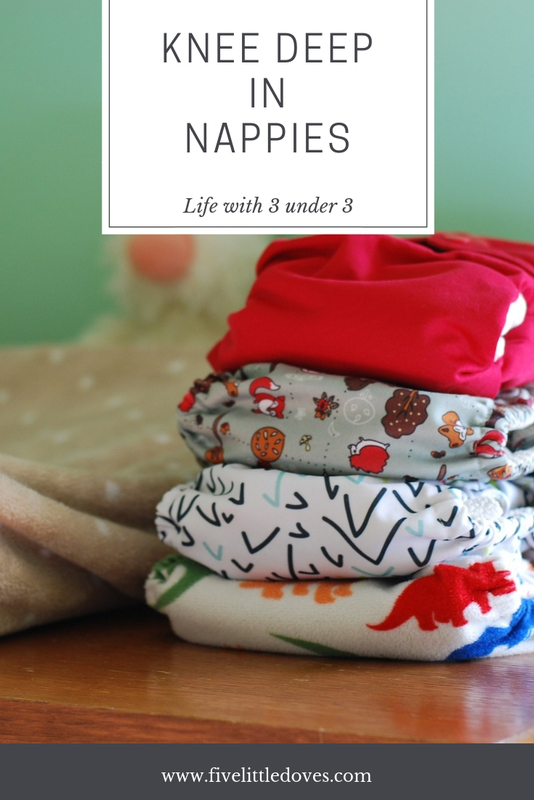 It isn’t easy when you’re knee deep in nappies, when you’re tired and irritable and there just aren’t enough hours in a day. But at 3am when I’m feeding the baby or a little one is creeping into our bed I tell myself that I am the luckiest woman alive and it is impossible to feel anything other than pure joy and gratitude….and a suitable amount of smugness that while Gaz snores besides me, I shall yet again claim my victory as The Most Tired Person On The Planet. Previous Post: « Quick, before one of them notices Im missing!!!! I truly admire how you managed to get through all these days and it is incredible that you are still here to tell the tale. You are a great mother and look how far you have come since writing this post! You have strolled ahead in leaps and bounds!